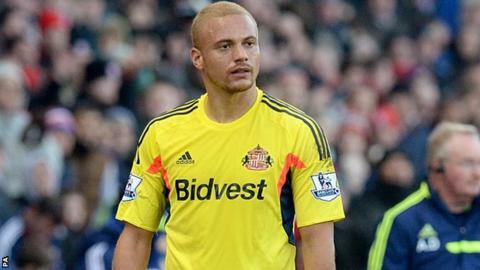 Sunderland's Wes Brown has had his red card for a tackle on Stoke's Charlie Adam during Saturday 2-0 defeat overturned by the Football Association. The Black Cats appealed against the sending off after the defender, 34, appeared to take the ball cleanly. "It was hugely frustrating but we accept officials are only human and like everyone, they can make mistakes," said Sunderland head coach Gus Poyet. "We are delighted with their decision, which is fair and just." Poyet added: "Today goes some way to rectifying the error and we are delighted to have Wes available for Saturday's game at Aston Villa. "I would like to express my thanks to the panel for giving the matter their consideration. Referee Kevin Friend, 42, has not been given a match to officiate for the next two rounds of Premier League games. Crystal Palace's appeal against Yannick Bolasie's red card for a tackle on Hull's Jake Livermore was rejected by the same panel. Meanwhile, the FA says no retrospective action will be taken against Manchester United's Wayne Rooney, Everton's Kevin Mirallas and Cardiff midfielder Gary Medel for incidents in their sides' matches. Poyet was visibly angry at the decision to dismiss Brown, with his side trailing 1-0 at the Britannia Stadium. "I have spoken with Mike Riley (general manager of the Professional Game Match Officials Limited) and whilst the details of our conversation will remain private, I am satisfied with today's outcome," added Poyet. On a weekend in which there were a number of controversial refereeing decisions, Rooney admitted he made a "bad tackle" after kicking Cardiff's Jordon Mutch in a 2-2 draw at Cardiff City Stadium. And Medel appeared to slap Manchester United midfielder Marouane Fellaini in the same game. New FA rules designed to make retrospective action more usable came into action ahead of the weekend's games. But England striker Rooney will receive no further punishment other than the yellow card handed to him by Neil Swarbrick, as retrospective action cannot be taken when match officials have seen the incident. None of the match officials saw the incident involving Medel, so it went before the FA's new "not seen" panel, which can punish players retrospectively, but the panel felt no action was necessary. Mirallas will also escape any ban as a result of a knee-high tackle on Liverpool's Luis Suarez in the first half of the 3-3 draw at Goodison Park. "When I made the challenge the first thing I thought was that it was going to be a red card," admitted Mirallas, who Liverpool manager Brendan Rodgers said should have been sent off. "I was genuinely going for the ball but I know I caught him on the knee and I said sorry straight away."